Line a large baking sheet with foil and spray with nonstick cooking spray. 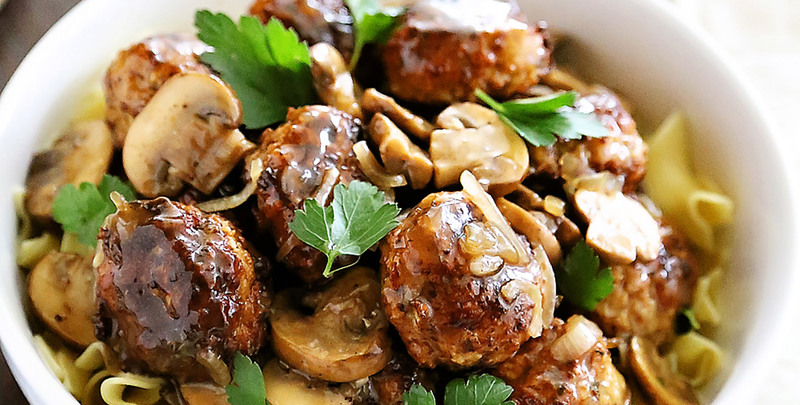 In a large bowl, combine all the ingredients for meatballs. Mix thoroughly with your hands until all the ingredients are well incorporated. Form mixture into about 25 (1½-inch) meatballs. Place on lined baking sheet; set aside. Set a large nonstick skillet on medium-high heat; add 1 cup olive oil. Once oil is hot, add meatballs and fry until golden brown, 5-7 minutes, flipping once halfway through. (If meatballs appear undercooked, place on lined baking sheet and into a 350ºF preheated oven for 10-15 minutes). Remove with a slotted spoon to a paper towel-lined plate. If necessary, fry in batches. Carefully discard oil and scrape browned bits out of pan. Reduce heat to medium-high. Add 1 Tbsp. oil. Once hot, add mushrooms and minced onion to pan, cooking until softened and browned. Add Holland House® Marsala Cooking Wine and reduce liquid by half, about 1 minute. Return meatballs back to the pan and toss in sauce until well coated.